Jaycar have sold the MP3090 (Manson SPS-9400) over many years. I have one dated 2001 and they are still in their catalog in 2015. Manson is a Chinese manufacturer of medium quality power supplies, at reasonable prices. 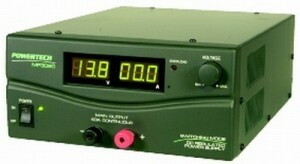 The MP3090 is a switched mode DC power supply, 3-15V at 0-40A. Over the years, I have routinely taken the covers off to blow accumulated dust out and check the health of the large capacitors, noting that they used 85° capacitors and they are located quite close to heatsinks that operate in excess of 60° under load. These power supplies are prone to carbonising dust build up around high temperature high voltage parts leading to certain failure of the supplies. 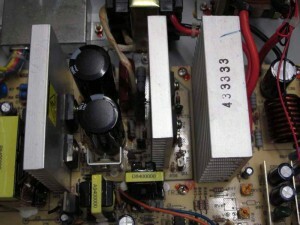 Above, the two high voltage filter capacitors located between the heatsinks for the input boost regulator (left) and the main switcher stage. 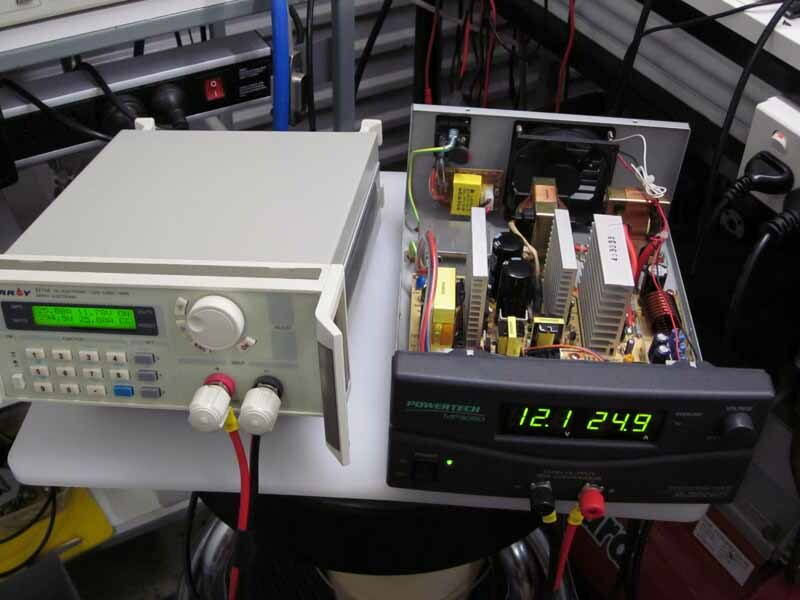 The main low voltage filter capacitor at the upper right on the DC output is also critical to good performance. On inspection, one of the high voltage caps was bulging, a sign of impending failure, so a decision was made to replace the two high voltage caps (680µF 250V) and the main low voltage capacitor (4700µF 25V) as preventative maintenance. The replacements would be 105° electrolytics by a reputable manufacturer rather than the low temperature unknowns used in Manson’s budget build. ESR was measured for all of the removed capacitors, and the bulging capacitor has slightly elevated ESR, not enough reason to condemn it, but the bulge was all the reason needed. Much easier to repair now than after explosion of an electrolytic, the mess and subsequent damage internally and possibly externally (the load). It turns out that physically identical capacitors were not available from most suppliers, but a source was found, albeit an expensive option. The capacitors were replaced and the power supply load tested (although I could not test it at full power). Whilst the power supply was reliable on the fixed 13.8V setting (which is how it had been used recently), it was very unstable in the front panel adjustable mode. It turned out that this fault was due to degradation of adhesive that Manson had used around the back of S2 and the wires to the front panel pot module. The adhesive had become conductive and needed to be carefully removed and the board cleaned. 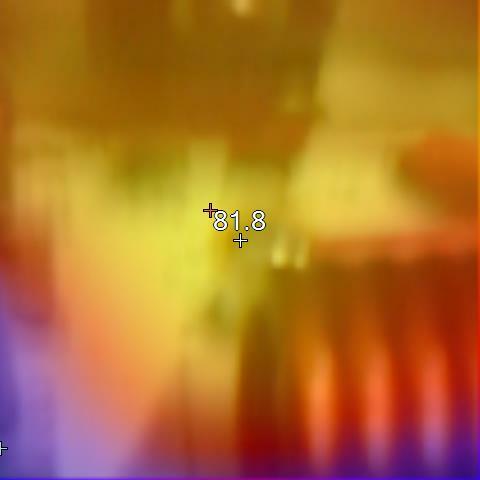 The above thermograph shows the hottest part of the power supply at 30A current, it is one of the output rectifier diodes which reached just over 80° with lid off. Note that with lid on, cooling air is drawn from front mounted vents to the rear fan and operating temperature is probably lower. Certainly is was possible to trigger the thermal overload operating at high current with the lid off. A second power supply was more straight forward, about 15min for the repair and removal of adhesive (though of a different type) as a preventative measure, and the device was ready for test… which it passed, and then lid on. These are high maintenance power supplies, both have had the fans replaced, both have had dust blown out every couple of years, one had carbon deposits cleaned out, one needed degraded glue residue removed, one required capacitor replacement and the other done as PM.